These Online Personal Training Success Stories are from women just like you, leading real lives, with real families, careers and busy schedules. Women who have proven that leading a healthy and fit lifestyle is possible. They have stood where you stand today and decided to take a stand to live a FIT BODY life! Check out their stories below. Trying to make an incredible body transformation and lose 30, 40 or 50 pounds? Click below to find the best body transformations. Busy mom trying to balance it all and find time to make fitness a priority? Click on the busy mom section and see how other moms are making it work! Wanting to compete in a figure or bikini competition? Sort the success stories by competitor to hear about their competition successes. Wanting to lose weight once you are over 40, over 50 or over 60? It is possible to be in the best shape of your life! Click on the over 40 section to hear from women that have changed their bodies and their lives over 40! Julie Lohre featured on Cover of GORGO Women’s Fitness Magazine! Protein Bar Recipe – Healthy Protein Bars Recipe at Home! Julie Lohre has helped thousands of women in her online personal training program! You could be next! Over the last 15 years, I have been working exclusively with women in my online personal training program and have seen some incredible successes and body transformations. What I love most though is not the weight loss transformations or the exterior changes. It is what happens on the inside when a woman fulfills their dreams and truly gets into the best shape of their life. The confidence they gain... the positive outlook they have on life. The sense of accomplishment that comes from knowing you can set an incredible fitness goal and crush it spills over into all aspects of their lives. Women that accomplish their dreams feel like they can be better wives, better mothers, better sisters. They know they lead their families and friends by example. In this section you will find some pretty awesome online personal training success stories and the body transformations that these hard working women made. These kind of weight loss changes... they are really just the start. Check out the confidence that comes through in each 'after photo' as you read their stories. Imagine how making this kind of change would impact your life. So, yes, losing weight is important but it goes so much deeper. These women are STRONGER in every sense of the word. They are HEALTHIER and have the blood work and health testing to prove it. They are FASTER & more FLEXIBLE. Changing your life and your body from the inside out it what it is all about to be a FITBODY. I would love the chance to help you through this journey as well! 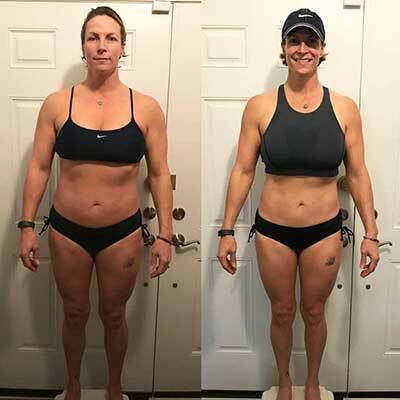 At 46, Christine Reeb made an incredible 6 month body transformation and decided that she did not need to compete to achieve the body of her dreams!